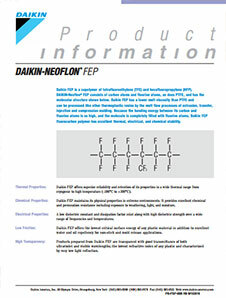 NEOFLON™ EFEP RP-5000AS by Daikin is a functionalized, conductive, static disspating, ethylene fluorinated ethylene propylene (EFEP) copolymer grade. Exhibits excellent processability, high adhesion strength, electrical- and non-sticking properties. Offers low reactivity, chemical stability, cold impact resistance, resistance to permeation-, heat aging-, weather- and chemicals. Provides low coefficient of friction, low processing temperature, very low melting temperature, and adheres to many kinds of plastics, inorganic materials (glass, metals) without adhesive or etching. Designed for tubing extrusion and co-extrusion with other resins (nylons, EVOH, modified PE, and ETFE) without adhesive or etching. 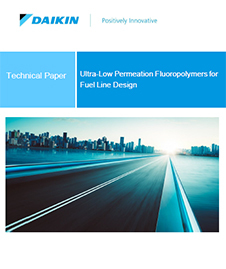 NEOFLON™ EFEP RP-5000AS is recommended for injection molding parts, automotive, bottles, containers, straight/convoluted tubes, tubing for fuel lines, mono- and multi-layer tubing/films.